Becca is So Very Beautiful! Becca's "Beach Tint" found its way into our home in a unique way. I have a friend with the name of Becca. I saw this product online years ago, found the product name amusing, and sent one to her and another to myself. I could not be more glad that I did this! "Beach Tint" is a gorgeous, creamy stain for both cheeks and lips. It is available in a wide variety of flattering, stunning shades fo...read morer $25.00 at Sephora. I began with a cheery pink--"Watermelon." It is an exquisite hue with a complementary, delectable watermelon fragrance. This tint is completely oil-free and blends easily, with no seams where color begins and ends whatsoever. Coverage is subtle. You can dispense a small amount from the tube and continue to add color until you reach the intensity of the shade you want (a small tube does last a long time). Vitamin E and a Nylon complex make this formula most comforting, even when you apply it to your lips. It is non-drying and gives a natural flush of very long-lasting color. This is one of the best tints I've ever used and I plan to collect several more in the near future. It's a great addition to your spring makeup collection, a great multi-tasker which will see you through days of sun and fun! I picked this up in the color Lychee, which is a bright pink. The tub packaging is great because you can squeeze out precisely the amount of product that you want, and trust me a little of this goes a long way! This product blends beautifully on the skin. Even though Lychee is a bright pink, when I blend it out, the affect is quite subtle. It can also be built up for a brighter cheek look. 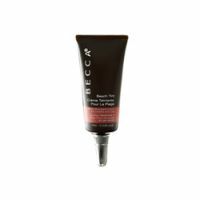 Be...read moreach tints can also be used on the lips and this works great for that as well. I just dab a bit on and it works like a light stain on the lips. It goes in fairly wet but dried down to a matte finish. Because these are cream blushes in a tube, the consistency is different to your typical cream blush/lip product. It goes on more oily for lack of a better word. However, these will not make your skin look greasy at all. This just makes it super easy to spread and blend, but just like it does on the lips, the product dried down to a soft, non greasy finish that looks natural and pretty. I'd love to pick these up in more colors because they are so easy to work with, have great color pay off and last so well on both the cheeks and the lips. These were expensive and it felt nice at first but then it felt really dry.